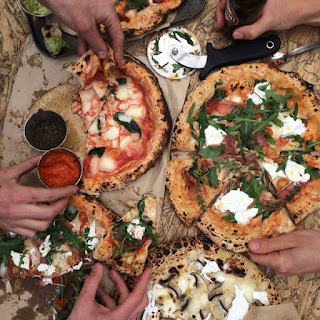 Made of Dough, who operate out of Pop Brixton, are opening a new pop-up pizza parlour at Market Yard in Shepherd's Bush, open for six weeks from Friday 25th March, serving Wednesday to Sunday. Founded in 2014, they won the innaugural London Pizza Festival last year, and this pop-up comes prior to opening a permanent pizzeria in the summer. Catch a rising star! "2015 London Pizza Festival Champions, Made of Dough will take their award-winning Neapolitan pizza to Market Yard Kitchen for a 6-week residency on the 25 March. The brand new menu is a preview of what fans can expect at their permanent South London site coming this summer, full details of which are soon to be announced! Making their debut will be pizzas, desserts, sides and cocktails – all reflecting the team’s Italian / Southern Spanish roots. As well as the favourites they’ll be introducing the indulgent new dessert pizza: Conchiglia a Nutella - warm folded dough filled with oozing Nutella and hazelnuts (£5). A new selection of homemade dips and sides will also be on offer. And to wash it all down there’s a choice of 3 refreshing summer cocktails: Amalfi Negroni (£8); Blood Orange Sangria (£7); Stailbano Spritz (£7), and a concise selection of Spanish and Italian wine and beer. Made of Dough will have residency at Market Yard Kitchen from 25 March - 1 May 2016. They are now taking bookings by phone and email (details below). The kiosk will remain at Pop Brixton during this time." My weekly newsletter features news about all of the latest and best pop-up and temporary things in London. Please sign up below!